It’s fun to be a developer. 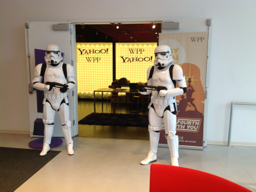 Recently, I was able to compete in a yahoo hackathon and my team was able to score second. It wasn’t half bad that the theme was all star wars and we went home with cool light sabers. I learned a whole lot, but what I learned the most was that we work best as a team. Not just developers, but also artists and IT professionals as well. Having PMs and other well-meaning professionals filter our communication also adds considerable inefficiency and a lot of strife.